Learning how to cook hard boiled eggs isn’t hard. Here is an easy recipe for hard boiled eggs. Layer a few eggs in a saucepan and cover with two inches of water. Slowly let them come to a boil so they won’t crack. To keep the egg whites from oozing out, add a tablespoon of vinegar. Once the eggs boil, take them off the heat for several seconds. Lower the heat and set the pan back on the burner and simmer 60 seconds. Take the pan from the burner after one minute and let them sit for around 12 minutes or 10 minutes for bigger batches. To test if they are done, run cold water over them. Boil for ten more minutes if needed. 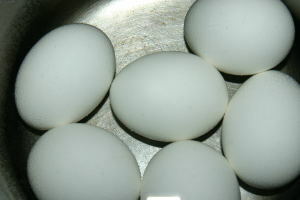 Hard-boiled eggs can be turned into egg salad by mashing them and adding mayonnaise, onions, and pickles to taste. Lemon-aid and iced tea served on the side and an egg salad sandwich make a delicious snack. This is a good way to get protein and Vitamin D in your diet.